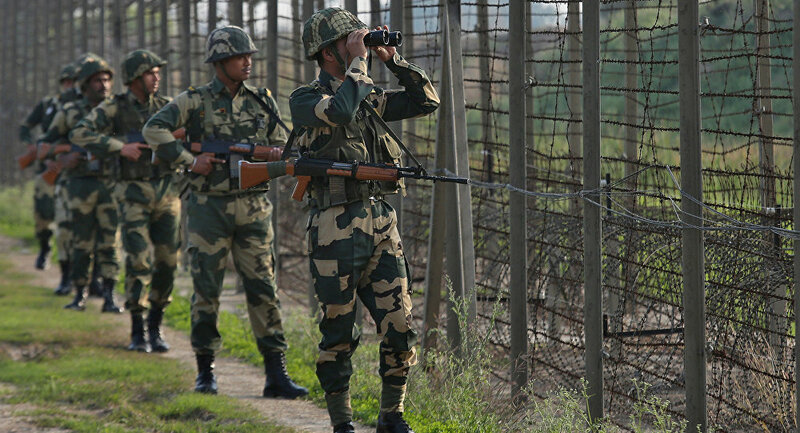 New Delhi (Sputnik): At least four terrorists were killed and five security personnel injured in four separate gunfights that took place within the last 24 hours in the Indian state of Jammu and Kashmir between Indian forces and terrorists. On Friday morning, Indian security forces laid siege to Gadapora, a village in Shopian district, after being informed that terrorists were holed up there. In the ensuing gunfights, which started at 3:00 a.m. local time, one terrorist was killed. Local sources told Sputnik that some youths in the vicinity had tried to disrupt security forces in order to provide the terrorists with an escape route, made the job of the security forces quite tough. In another incident that took place on Thursday evening in Sopore in Baramulla district, a fresh exchange of fire took place between terrorists and security forces after a terrorist search operation was halted in the evening due to darkness. Three security personnel were injured after terrorists opened fire and had hurled grenades as the operation unfolded. In the third encounter which took place again on Thursday night in the Kalantra Kandi Kreeri area of Baramulla, two terrorists were killed and at least three security personnel were reportedly injured. Three local youths were also injured as security forces used teargas shells to quell protests that were taking place there. "In the ensuing encounter, two militants were killed and the bodies were retrieved from the site of encounter. Their identities and affiliations are being ascertained," a statement issued by the local police reads. #OpHajin (#Bandipora). Two #terrorists eliminated. In the Bandipore district, security personnel successfully eliminated a terrorist after fire was exchanged on Thursday in Mir Mohalla following a massive search operation launched by the Indian forces. Mild clashes also took place near Hajin bridge between Indian troops and the terrorists. Kashmir has been a disputed region with India and its neighbour Pakistan; both have staked a claim to it since 1947. The two nuclear-armed nations have fought three major wars since then. Relations between India and Pakistan witnessed a sharp decline over the 14 February Pulwama terror attack, which left over 40 Indian troops dead; India claimed that Pakistan had been a facilitator of terrorism. India has been accusing Pakistan of harbouring terrorists, a charge which Pakistan denies. Last month the two conducted air strikes into each other's airspace in a demonstration of their power and readiness to retaliate in the event of misadventure.